I’ve always loved going to the library. There’s something wonderful about wandering around bookshelves full of stories that you haven’t opened yet, a sense of infinite possibility and knowledge. When I was a kid, I always started in on my weekly stack of books on the car ride home—even though it made me carsick every single time. I couldn’t help it. I have recently discovered a new use for the library: cookbooks. I love cookbooks. I love cooking from them, I love ogling their pictures, I love being able to flip through them for inspiration. I don’t love buying them. They tend to just languish on the shelf as I explore blogs and cooking sites for possibilities. But if I get a cookbook from the library, I know that I only have it for a few short weeks and have to use it NOW. And three weeks later, I exchange it for a totally different style of cooking and start all over. My latest obsession is Rick Bayless’ Mexican Kitchen: Capturing the Vibrant Flavors of a World-Class Cuisine. It’s the kind of cookbook that I look through and want to make everything immediately, from the salsas to the enchiladas to the desserts (mmm flan). And the things I have made have been incredible. My first excursion into the land of Rick Bayless was his “Essential Chipotle Salsa,” a simple but amazingly flavorful combination of dried chipotles (and oh my goodness where have these been all my life? Amazing), roasted garlic, roasted tomatoes, and a little olive oil. Easy, fast, four ingredients—and it will blow your mind. Part of the great flavor in this sauce comes from the roasted garlic, which has a completely different flavor profile than in its raw state. Garlic, onions, leeks, shallots, and chives are all part of the genus Allium, with the characteristic bite that comes from sulfur compounds in the plants. Originally intended to keep wild animals from eating them, the four sulfur-containing compounds float freely in the fluid of the plant cells. They’re harmless in the undisturbed plant, but a vacuole (a special storage compartment inside the cell) contains an enzyme (a protein) that activates the compounds to their strong, pungent form. When the cell is damaged, either by chewing or by cutting, the cell releases the enzyme and the activated sulfur compounds are ready for action. So what happens if you don’t release the enzyme? Roasting whole garlic keeps the storage vacuole intact and the enzyme safely separated from the sulfur compounds so that they don’t turn into the active form. The high temperature of roasting denatures the enzyme, which means that it loses its specific shape necessary to do its job. Proteins are long chains of amino acids (held together by covalent bonds) that fold into compact, complicated structures (held together by hydrogen bonds, hydrophobic interactions, and other weak bonds). Cooking the garlic breaks the weak bonds holding the enzyme in its shape so that it’s just a long chain. Since the shape is essential for its function, the enzyme no longer works—this is called denatured. Because the enzyme no longer packs any punch, you can cut or bite into roasted garlic without activating the sulfur compounds and getting the strong flavor of the raw clove. 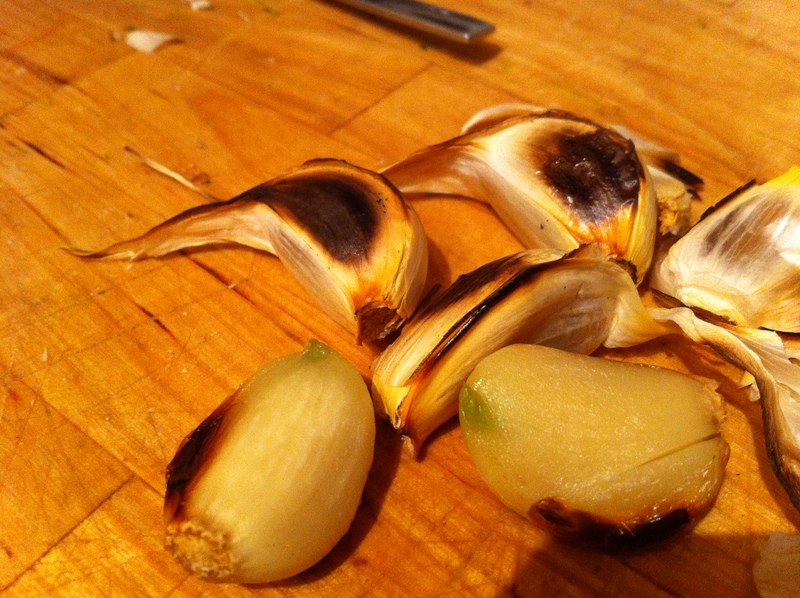 Roasting changes the flavor of garlic in other interesting ways, notably making it much sweeter. Most plants store their energy in starch molecules, but alliums (garlic and onions) and the sunchoke family store energy in long chains of fructose sugars. The chains don’t taste like much, but roasting breaks down these chains into individual fructose molecules—sugar! Roasting also causes some of the same caramelization reactions that create complex and yummy flavors in caramelized onions. Rick Bayless has opened my eyes, and there’s no going back. Chipotles are amazing. I’ve always been intrigued but intimidated by the bags of dried chilies I see at the store, but now I’m hooked. They’re smoky and spicy and pack a really powerful flavor punch. This simple salsa capitalizes on all of these qualities and is great as a sauce or stirred in for more flavor. I’ve used it on nachos, on beans, and in soup. 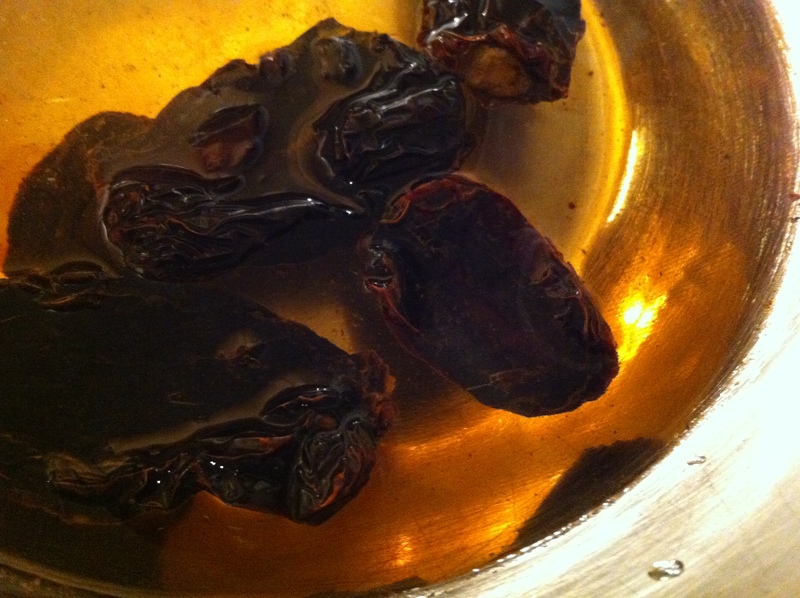 Toast and soak the dried chiles: break off chile stems and place them on an ungreased pan over medium heat. Press them down with a metal spatula for a few seconds, then flip and repeat on the other side. Remove from heat and let soak in hot water for 30 minutes, stirring occasionally. Discard the soaking water. Roast the garlic and tomatoes: place the unpeeled garlic cloves on the same ungreased pan. Roast for about 15 minutes or until soft, turning occasionally. The peel will blacken in spots. 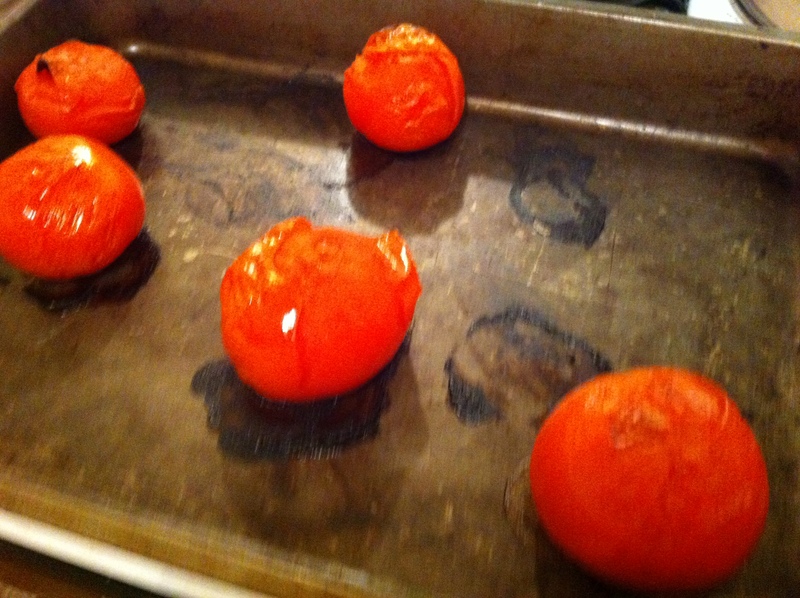 Put the tomatoes on a baking sheet and broil for about 6 minutes, until they are blistered and soft. Turn them over and roast the other side. Peel, making sure to collect all of the juices. 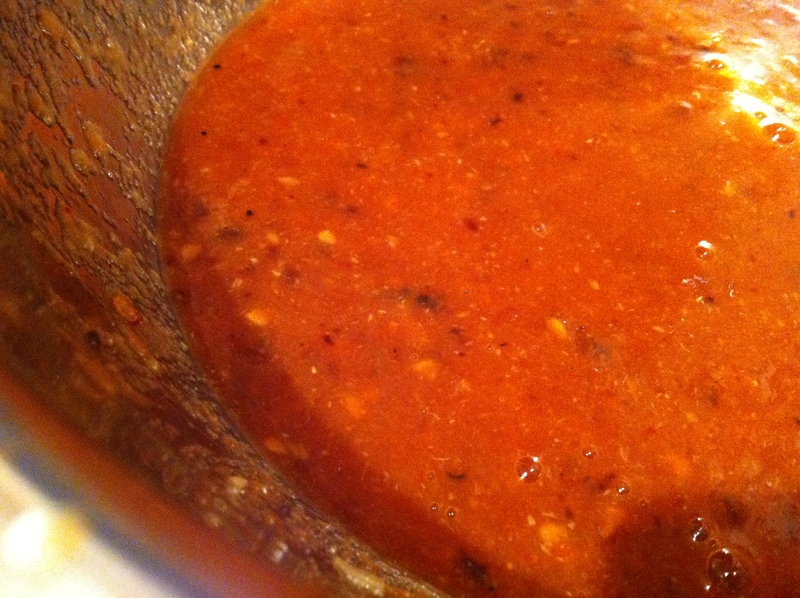 Make the sauce: combine the chiles, tomatoes, garlic, and salt with a food processor or immersion blender. Heat the olive oil in a large pan, and add the sauce. 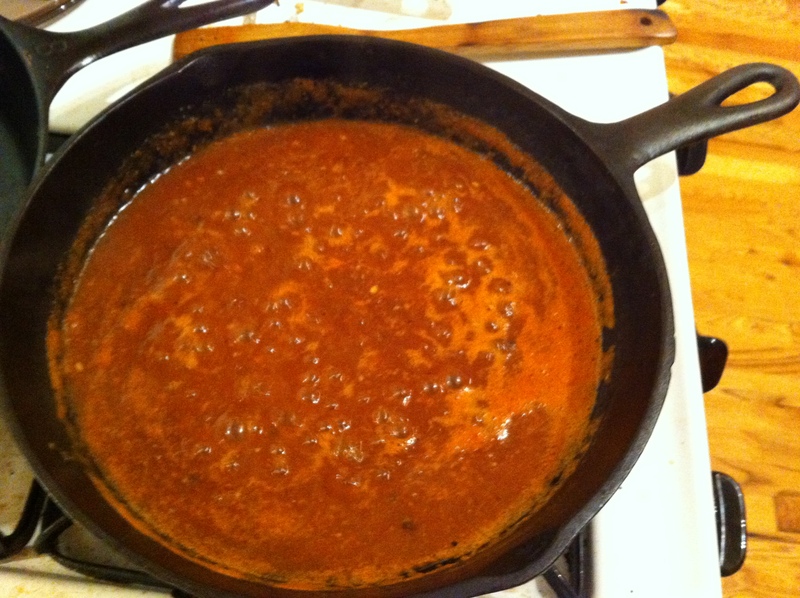 Cook until it thickens to about the consistency of spaghetti sauce.